Discussion in 'Downhill & Freeride' started by mandown, Jan 9, 2008.
looks good. has info on the new bikes. Jedi looks the best out of the bunch. I'm gettin mine as soon as the are ready to ship! Still keepin the F1 though, It is a serious plow bike for smashing and landing. Love it!!!!! kewl! Ordered a jedi from the norwegian retailer a month ago. Tis will be a nice summer. I noticed the new site earlier this week. MUCH nicer than the old one. The Jedi looks absolutely sick and while I am not a huge fan of the appearance of the others, the design and concept seems solid. Having never even ridden a Canfield they somehow manage to keep me drooling over them. Spoke to Chris yesterday and he is at Bootleg riding Jedi. agreed that the Jedi looks dope, and i'm sure it rides just as well. it is a bit strange to see the "DH" bike with 7.75" of travel. i'm sure it will hold up just fine. gotta admit, "the one" is growing on me. Wow!!!!! 8" of travel at only 7lbs with shock? 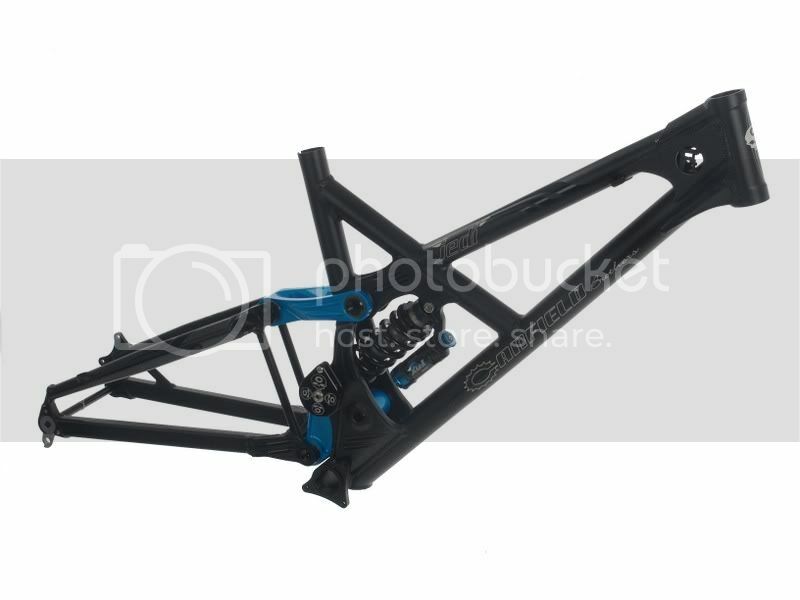 I see a 33Lb DH bike built up some time soon by someone. Don't Canfield's have a lot of rearward wheel travel though? I'm sure that 7.75" feels like a lot more. And yes, The One is growing on me as well. They do indeed. If I recall correctly one of the models has 2.5" of rearward movement. I've gotta say I'm pretty stoked on the new suspension design. Hope those shorter travel bikes show chainstay length at bottom out. The Jedi has 16.26" w/o sag, 17.39" w/sag, and 18.73" at bottom out. Most of the other frames only show around 17.5" but the chainstay is pictured as bottomed but the measurement looks like w/o sag? It's not as big of an increase as I thought, but if it has about 2 inches of rearward travel as well then it puts the overall travel at just over 8 inches. In a fairly light frame that sounds about perfect for a race bike. The One and Can-Diggle in 8" go from 17.5" to 18.3" CS length. It's 17.8" on sag. The Jedi has 7.75" vertival and 2.5" rearward. It doesn't feel super deep vertically, like when your bunny hopping, but at speed, hitting bumps, it feels smooth like it has 10" or more. The chainstay as sag is still 1/4" shorter than other bikes. I think the only bike lighter is a Socom. Come on, you and I both know that fool (flymybike) couldn't huck a garbage can!!!! Dude works at 7-11 and reads mtb action while popping a 32oz slurpee. That's a pretty big bite you got there for a chiwawa ! ...and now, back to the thread. I fill my Camelback with slurpee. It's the best way to refuel! If I drink 2 32 oz ers I can levitate. Bike price are getting to high. Nice though. LMAO! A coke/blue cherry mix make for the ultimate brainfreeze. Chris and Lance let me take the Jedi proto for several runs here in Utah. I want everyone to know, I have no ties to the Canfields. They are friends that I have ridden with, off and on for years, but in no way am I being prompted to say anything about this bike. (No Sponsorship, high fives, or free beer)..this is just me being honest. I have ridden and raced about everything on the planet when it comes to DH bikes over the course of the last 8 years. (Turner, Kona, Intense M1, Scott High Octane, Demo, Ventana, V10, Sunday) All of which are good for certain things. I feel like I know more than most when it comes to suspension design, race geometry, construction do's and dont's, etc. If someone were to say "Ok...we want you to race the world cup circut, you can have ANY bike you want"... Without hesitation, It would be the Jedi. I swear that bike made me 5 sec. faster. It accelerates over rough stuff due to the rearward wheel path. But because of it's super short chain stays, it remains nimble and very quick. It's the fastest bike I have ever ridden. As most of you know, most bikes with rearward tend to feel sluggish, and slow. They tend to corner weird due to the wheelbase getting longer in the corners as opposed to getting shorter. They feel like a huge plow. Somehow, they found a way to make that crazy rearward wheel path work. The 7.5 inches feels super deep. The suspension ramp is perfect. You can get to the bottom of it, but you have to try really hard. Bottom line is, it rips. It's super stable at speed, tracks amazing, corners really tight, and is super stiff. I have sponsors who will be pissed to see this post. Hopefully they won't get too bent. I truly believe Chris and Lance have built an amazing thing here. I know they have been working on the details for years. It's finally here. Good to know, as I will be sporting 1 for the 08 season! Nice, I can't wait to try it out.